By day, I am a psychologist that works with hospitalized children and their families. However, my alter ego is an emerging Canadian artist who uses any opportunity to be creative in day-to-day life while managing an active family life. Eight years ago I made a serious effort to join the arts community and was invited to sell paintings at Lovecraft Gallery in Calgary. After a few years, I moved to an amazing online gallery named FosterMAK, which is owned by fellow artist Stacey Walyuchow. This mother-turned-entrepreneur is well known for her charity towards the Alberta Children’s Hospital, which made her gallery a perfect fit for me. I have also participated in art shows at Elevation Gallery in Canmore, Alberta College of Art and Design, and many other local venues. At this time, I tend to paint using acrylics but I will dabble in oil painting when the mood strikes me. I like to use a gallery-style canvas and paint the sides black to frame the painting. I also love to sketch, scrapbook, and use digital media to create artwork. My painting style is modern and impressionistic, often with emotionally evocative content. Inspiration for my art comes from my work with hospitalized children, my history, my family, and my love of bright, strong colors. I am often drawn to painting figures but can’t seem to limit myself to a particular style or subject. I also tend to use my fingers and household items in painting at least some part of my picture. As a child, art was my escape, my way to cope, my secret, and my joy. My parents fed my passion with art classes and purse draining trips to the art store. 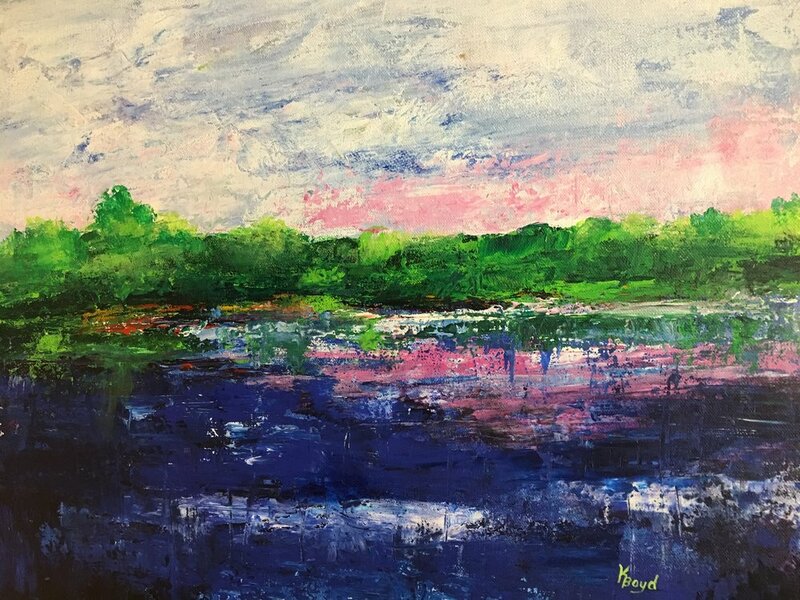 While I struggled with making life-like landscape pictures, I quickly discovered freedom in creating impressionistic and abstract art. At various times in my life, it has been my lifeline as well as a source of achievement. I have always been drawn to art but I was a teenager when I began to be serious about painting. I have memories of taking the transit to the Alberta College of Art when I was 16 years old every Wednesday after school for oil painting lessons. I took every art class offered at school and was in every possible art-based club. When I started training in psychology at university, I found ways to incorporate art practice and knowledge in my studies. My zest for creative interventions was readily apparent when I first began to work in residential treatment centers and then hospital settings. For the past 20 years, I have shared my passion for art and creative interventions with therapists, nurses, doctors, social workers, and teachers. My hope is to foster the creative spirit in others and to provide opportunities for wounded children to heal through art. While art has been a way for me to cope with life demands, it has increasingly become a way for me to celebrate life and beauty. For now, my art represents anything I feel - from raw emotion to a new spiritual awakening. I tend to spent weekends painting or sketching. I always have a sketchbook on me and tend to design new paintings when I am bored or on a break. My travel bag is always loaded with art supplies just in case I get some down time. There are days when I feel I have the perfect balance and days when I wish I could paint or sketch more often. My favorite part of creating is not the finished product. Rather, it is the moment where I take the brush in my hand and watch the paint color the blank canvas. There is something so satisfying in watching the white disappear and become something else. It is almost a meditative experience for me. I’m not sure how to answer this question because it takes me too much into my head. When I paint, it is not a thinking process. It is an emotional process and often an out-of-body experience. I often feel driven to paint and restless if I cannot do so. Painting is more of a need rather than a desire. If I had to come up with something it would be to echo a quote by Leonardo da Vinci. “Art is never finished, only abandoned." I always feel that I am simply stopping my painting at a certain point and it is never truly done. I still can’t hang my own paintings on the wall because I keep wanting to make changes. Creative joy, for me, is the feeling of personal satisfaction when I have managed to create something that matches the idea in my head. It is also that sense of pride when I have made something beautiful or interesting from simple materials. How do you contribute to the arts community? For almost a decade, I have given lectures and advocated for the use of the creative arts in schools and therapy. 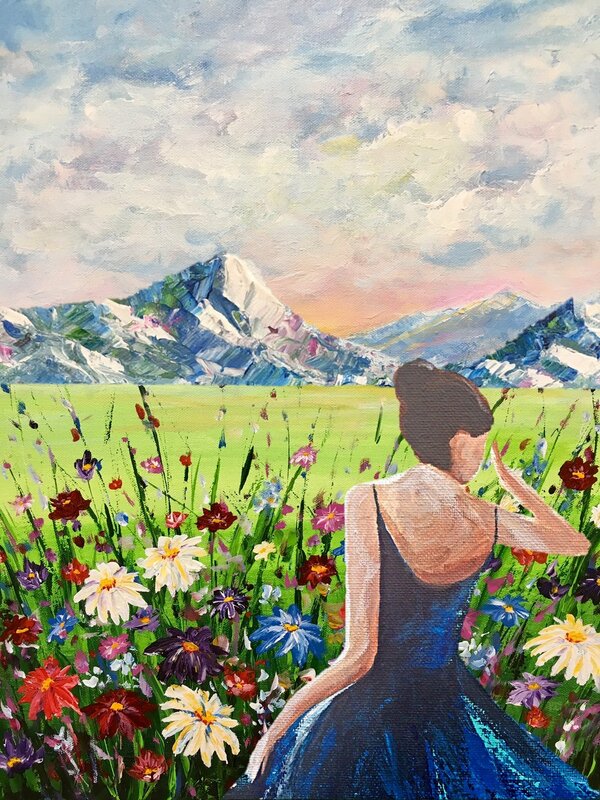 Part of the proceeds from every painting sold is donated to the Alberta Children’s Hospital Mental Health Unit to purchase group therapy supplies required for creative interventions or projects. I have also donated paintings to specific charity drives for auction since I firmly believe that we need to support our community.